As part of my process, I update the list of dividend champions every month. I find it extremely helpful to go through the process of updating the list, in order to identify companies that I may have missed for my regular weekly dividend increase reports. I also find it helpful to have another point to touch base on the dividend investing universe, which can offer a glimpse into potential opportunities for further research. I like to immerse myself into dividend growth investing, and following dividend increase and maintaining the list of dividend champions definitely keeps me in fighting shape to pounce when the right opportunity is available at the right price. A dividend champion is a company that has increased dividends every single year for at least 25 years in a row. This is a very difficult thing to achieve, which is why there are only 127 companies in the US that have managed to do this ( out of 10,000 or so). I find the list of dividend champions to be more complete than the list of dividend aristocrats. The list of dividend aristocrats uses inconsistent criteria to add and remove stocks, and has excluded companies for no reason in the past. Given that I update the list of dividend champions, and post the supporting data behind each dividend champion, I have list of companies have raised dividends for 25 years in a row. I am very comfortable with the list of dividend champions for those reasons, which is something I cannot say about the list of dividend aristocrats. If you study the historical changes in the dividend aristocrats you will understand my point of view. Over the past month, there were several dividend champions that raised dividends. We also had three new additions to the list. You can download the list using Google Documents or Using Dropbox. Subscribers to my free email list will receive the file in a spreadsheet format. Brown & Brown (BRO) raised its quarterly dividend by 6.70% to 8 cents/share. This was the twenty-fifth consecutive annual dividend increase for the company. United Technologies (UTX) raised its quarterly dividend by 5% to 73.50 cents/share. This newly minted dividend champion typically raises distributions every five quarters, rather than every four quarters. Thompson Reuters (TRI) raised its quarterly dividend by 1.50% to 35 cents/share. The company raises dividends at a slow pace to get to the coveted 25 year streak of annual dividend increases. V.F. Corporation (VFC) raised its quarterly dividend by 10.90% to 51 cents/share. This marked the 46th consecutive annual dividend increase for this dividend champion. West Pharmaceutical Services, Inc. (WST) raised its quarterly dividend by 7.10% to 15 cents/share. West Pharmaceutical Services is a dividend champion with 26 years of annual dividend increases under its belt. Middlesex Water Company (MSEX) raised its quarterly dividend by 7.30% to 24 cents/share. This marked the 46th consecutive annual dividend increase for this dividend champion. Eaton Vance Corp. (EV) raised its quarterly dividend by 12.90% to 35 cents/share. This marked the 38th consecutive dividend increase for this dividend champion. A. O. Smith Corporation (AOS) raised its quarterly dividend by 22.20% to 22 cents/share. This was the second dividend increase this year for A.O. Smith. A.O. Smith is a dividend champion with 25 years of annual dividend increases under its belt. Calvin B. Taylor Bankshares (TYCB) raised its quarterly dividend by 1% to 98 cents/share. This is the 28th consecutive year that the Board of Directors has increased the regular annual cash dividend. Gorman-Rupp Company (GRC) raised its quarterly dividend by 8% to 13.50 cents/share. This event marked the 46th consecutive year of increased dividends paid to its shareholders. The company also declared a special dividend of $2/share. Mercury General (MCY) raised its quarterly dividend by 0.40% to 62.75 cents/share. This marked the 32nd consecutive year of dividend increases for Mercury General. Also marked the 7th year in a row where the quarterly dividend is raised by a quarter of a cent. RPM (RPM) raised its quarterly dividend by 9.40% to 35 cents/share. This action marked RPM’s 45th consecutive year of increased cash dividends paid to its stockholders. Stepan (SCL) raised its quarterly dividend by 11.10% to 25 cents/share. The increase marks the 51st consecutive year in which the quarterly dividend rate on the Company's common stock has increased. UMB Financial (UMBF) raised its quarterly dividend by 3.40% to 30 cents/share. This was the second dividend increase over the past year. The current payment is 9.10% higher than the payment done during the same time last year. This dividend champion has increased dividends for 26 years in a row. Tompkins Financial (TMP) raised its quarterly dividend by 4.20% to 50 cents/a share. This was the second dividend increase over the past year. The current payment is 6.40% higher than the payment done during the same time last year. This dividend champion has increased dividends for 32 years in a row. Cintas (CTAS) raised its annual dividend by 26.50% to $2.05/share. This is the 35th consecutive year that the annual dividend has increased, which is every year since Cintas went public in 1983. V.F. Corporation (VFC) engages in the design, production, procurement, marketing, and distribution of branded lifestyle apparel, footwear, and related products for men, women, and children in the Americas, Europe, and the Asia Pacific. It operates through four segments: Outdoor & Action Sports, Jeanswear, Imagewear, and Other. The company raised its quarterly dividend by 10.90% to 51 cents/share. This marked the 46th consecutive annual dividend increase for this dividend champion. Over the past decade, it has managed to increase dividends at an annual rate of 11.90%/year. The company grew earnings from $1.30/share in 2007 to $2.67/share in 2017. The 2017 figures are adjusted for the one-time impact of the new tax law introduced in 2017. V.F. Corporation is expected to earn $3.71/share in 2018.The stock is overvalued at 21.90 times forward earnings and yields 3.20%. V.F. Corp may be worth a second look on dips below $74/share. West Pharmaceutical Services, Inc. (WST) manufactures and sells containment and delivery systems for injectable drugs and healthcare products in the United States, Germany, France, Other European countries, and internationally. The company operates through two segments, Proprietary Products and Contract-Manufactured Products. The company raised its quarterly dividend by 7.10% to 15 cents/share. West Pharmaceutical Services is a dividend champion with 26 years of annual dividend increases under its belt. Over the past decade, it has managed to increase dividends at an annual rate of 7.20%/year. The company grew earnings from $1.02/share in 2007 to $1.99/share in 2017. West Pharmaceutical Services is expected to earn $2.82/share in 2018. The stock is overvalued at 35.90 times forward earnings and yields 0.50%. Middlesex Water Company (MSEX), together with its subsidiaries, owns and operates regulated water utility and wastewater systems. It operates in two segments, Regulated and Non-Regulated. The company raised its quarterly dividend by 7.30% to 24 cents/share. This marked the 46th consecutive annual dividend increase for this dividend champion. Over the past decade, it has managed to increase dividends at an annual rate of 2.20%/year. The company grew earnings from $0.87/share in 2007 to $1.38/share in 2017. Middlesex Water Company is expected to earn $1.84/share in 2018. The stock is overvalued at 24.80 times forward earnings and yields 2.10%. ONEOK, Inc. (OKE), through its general partner interests in ONEOK Partners, L.P., engages in the gathering, processing, storage, and transportation of natural gas in the United States. The company operates through Natural Gas Gathering and Processing, Natural Gas Liquids, and Natural Gas Pipelines segments. ONEOK raised its quarterly dividend to 85.50 cents/share. This is 14.80% higher than the distribution paid during the same time last year. This dividend achiever has rewarded shareholders with a raise for 16 years in a row. Over the past decade, ONEOK has managed to increase dividends at an annual rate of 16.10%/year. The stock is selling for 23.70 times forward earnings and yields 5.30%. Prosperity Bancshares, Inc. (PB) operates as bank holding company for the Prosperity Bank that provides retail and commercial banking services to small and medium-sized businesses, and consumers. The bank raised its quarterly dividend by 13.90% to 41 cents/share. This marked the 20th year of consecutive dividend increases for this dividend achiever. Over the past decade, it has managed to increase dividends at an annual rate of 11.70%/year. The company grew earnings from $1.94/share in 2007 to $3.92/share in 2017. Prosperity Bancshares is expected to earn $4.60/share in 2018. The stock is attractively valued at 4.10 times forward earnings and yields 2.60%. Westwood Holdings Group, Inc.(WHG), through its subsidiaries, manages investment assets and provides services for its clients. The company operates in two segments, Advisory and Trust. The company raised its quarterly dividend by 4.40% to 71 cents/share. This dividend achiever has rewarded shareholders with a raise for 17 years in a row. It has managed to grow dividends at an annual rate of 12%/year. Earnings per share rose from $1.63 in 2008 to $2.38 in 2017. There has been a decline in earnings per share from $3.45 in 2014. The forward dividend is $2.84/year doesn’t seem covered well from earnings over the past couple of years. I need to research this company further, to determine if it is cheap at 17.80 times earnings or it is a value trap. The stock yields 6.60%. Cass Information Systems, Inc. (CASS) provides payment and information processing services to manufacturing, distribution, and retail enterprises in the United States. It operates through two segments, Information Services and Banking Services. The company raised its quarterly dividend by 20% to 26 cents/share. This marked the 17th consecutive annual dividend increase for this dividend achiever. Over the past decade, it has managed to increase dividends at an annual rate of 9.90%/year. The company grew earnings from $1.43/share in 2007 to $2.01/share in 2017. The stock is overvalued at 32 times earnings and yields 1.70%. Magellan Midstream Partners, L.P. (MMP) engages in the transportation, storage, and distribution of refined petroleum products and crude oil in the United States. The company operates through Refined Products, Crude Oil, and Marine Storage segments. The MLP raised quarterly distributions to 97.75 cents/unit. This is a 6.25% raise over the distribution paid during the same time last year. It has rewarded limited partners with a raise for 18 years in a row. Over the past decade, it has managed to boost distributions at an annual rate of 10.90%/year over the past decade. The MLP yields 6.30%. I have been a dividend investor for over a decade. As part of my journey, I have developed a system for identifying attractively valued dividend growth stocks to add to my portfolio. After a decade of writing about investing, I started a premium investment newsletter in order to share my knowledge with readers who are looking for a serious resource to help educate them along their investing journey. I believe that this newsletter can be of value to both retired investors and those in the accumulation phase. Those guidelines are helpful to come up with a list of companies that I research further, one at a time in order to get a feel for the business and where it is going. As a long-term investor, I try to focus on companies that can keep earning more and paying more in dividends over time. I also try to acquire those interests at attractive valuations. Successful dividend investing is much more than selecting a few companies however. It also involves sticking to your strategy through thick and thin, by buying and holding a diverse group of companies on a regular basis. Monitoring is important, but staying put and holding tight is even more important, because it allows the investor to reap the maximum rewards of the power of compounding. I also believe in equal weighting my portfolio, and security and sector diversification. However, I also try to follow the availability of opportunities, and allocate my capital in the securities that show the best promise, for the best valuation. After going through my process this weekend, I came up with ten companies to add to my dividend growth portfolio. I purchased these ten dividend growth stocks after the market opened this Morning. I sent a list of those companies, along with a detailed qualitative and quantitative analysis to premium subscribers on Sunday. I believe that this newsletter is a bargain at $65/year. This comes out to less than 20 cents/day. If you sign up today, your price will never increase. Plus, there is a 7 day free trial. As part of my premium offering, I send a list of ten dividend growth stocks that I purchase for my dividend growth portfolio every single month. This newsletter includes detailed analysis behind each security. The newsletter also includes a few notifications about dividend portfolio holdings, and important developments that affect the companies in the portfolio. PPG Industries, Inc. (PPG) manufactures and distributes paints, coatings, and specialty materials in the United States and internationally. It operates through Performance Coatings and Industrial Coatings segments. PPG Industries is a dividend champion with a 47 year track record of annual dividend increases. The last dividend increase occurred in July, when the board of directors approved a 6.70% increase in the quarterly distribution to 48 cents/share. In the past decade, this dividend champion has managed to grow its distributions at an annual rate of 5.20%/year. The company has managed to boost earnings per share over the past decade from $2.52 in 2007 to $5.31 in 2017. PPG Industries is expected to earn $5.89/share in 2018. Earnings per share are more volatile, given the cyclical nature of the business. A large portion of PPG customers are in the housing, auto, and construction, which are exposed to the highs and lows of the economic cycle. The company has allocated roughly 40% – 50% of free cash flow towards dividends and share repurchases over the past decade. The rest has been reinvested into the business or invested in acquisitions. I believe that strategic acquisitions can deliver future growth, as long as they are not completed at inflated prices. After acquisitions and dispositions over the past decade, the company is now 100% focused on coatings. Approximately 60% of revenue is derived from specialty coatings, where specific types of paint are created and sold for a specific end client, which allows the company to pass through rising costs of raw materials and not compete on price. The rest of the revenues are for products where competition is based on price. The company is also exposed to the fluctuation in commodity prices, as it may not be able to quickly pass on rising costs to customers when commodity prices increase quickly. On the other hand, cost savings initiatives can help the company in reducing its costs structure over time. A cyclical company like PPG Industries can ride an expanding economy quite well, as volumes increase, and any excess volumes lead to higher marginal profitability that boosts earnings per share. On the other hand, when the global economy is sluggish, volumes are lower and earnings per share are depressed. A developing story as of this writing is the stake by activist investor Nelson Peltz’s Trian in PPG Industries. This even can unlock some value for investors today, although the long-term effects on the business could not be as optimal. Earnings per share growth has been aided by share buybacks instituted by the company. PPG Industries has managed to retire roughly a quarter of shares outstanding since 2007. Unfortunately, they didn’t start buying back stock in a more noticeable way until 2010. Share buybacks are most effective when stock prices decrease. The dividend payout ratio has gone all over the place, characterized by rapid spikes when earnings per share fall down. Currently, the payout ratio is sustainable at 32%. Using 2018 expected earnings of $5.89/share and the new annual dividend of $1.92/share, the forward dividend payout ratio comes out to 32.60%. Currently, the stock is attractively valued at 16.70 times forward earnings. PPG Industries yields 2%. The dividend is safe. While the P/E ratio is low, the stock may be an even better investment at lower prices from here - preferably around 15 times forward earnings. As part of my monitoring process, I review the list of dividend increases every week. This is a helpful exercise that lets me identify dividend increases for companies I own. I also use this process to identify dividend companies for further research. For the review of dividend increases, I usually focus on companies that have raised dividends for at least ten years in a row. The only exceptions are for companies I own with lower than a ten year streak. I run those companies through a basic list of requirements before analyzing them in a little but more of a detail. Those include growth in earnings per share, growth in dividends per share, dividend safety and valuation. At the end of the day, as dividend investors we want to buy our retirement at an attractive price. We also want to purchase those assets with expected growth in earnings to drive future dividend growth. When you combine the effects of a sustainable dividend payout ratio and earnings growth, we also have an above average safety factor in the dividend payment. A. O. Smith Corporation (AOS) manufactures and markets residential and commercial gas and electric water heaters, boilers, and water treatment products in North America, China, Europe, and India. The company raised its quarterly dividend by 22.20% to 22 cents/share. This was the second dividend increase this year for A.O. Smith. A.O. Smith is a dividend champion with 25 years of annual dividend increases under its belt. Over the past decade, this dividend champion has managed to grow distributions at an annualized rate of 17%. Between 2008 and 2017, earnings increased from 21 cents/share to $1.70/share. The company is expected to earn $2.61/share in 2018. The stock is attractively valued at 17.30 times forward earnings and a forward dividend yield of 1.90%. Visa Inc. (V) operates as a payments technology company worldwide. The company facilitates commerce through the transfer of value and information among consumers, merchants, financial institutions, businesses, strategic partners, and government entities. The company raised its quarterly dividend by 19% to 25 cents/share. This dividend achiever has managed to reward shareholders with a raise for 10 years in a row. The dividend has increased almost tenfold over the past decade – from 2.625 cents/share in 2008 to 25 cents/share in 2018. Earnings per share have also increased almost tenfold between 2008 and 2017 – from 29 cents/share and $2.80/share.The company is expected to earn $4.59/share in 2018. The stock is overvalued at 30.50 times forward earnings and a forward dividend yield of 0.70%. I would be interested in adding to Visa on dips below $92/share, equivalent to 20 times forward earnings. Eaton Vance Corp. (EV) engages in the creation, marketing, and management of investment funds in the United States. It also provides investment management and counseling services to institutions and individuals. Further, the company operates as an adviser and distributor of investment companies and separate accounts. Last week the company raised its quarterly dividend by 12.90% to 35 cents/share. This marked the 38th consecutive dividend increase for this dividend champion. Eaton Vance has delivered a 9.10% annualized total return over the past decade. 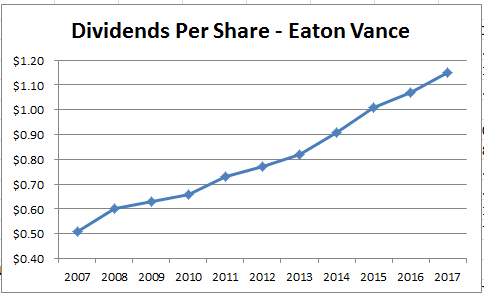 Eaton Vance has managed to grow dividends at an annualized rate of 8.50% over the past decade. The company has managed to grow earnings at a rate of 8.60%/year over the past decade. this was helped by the fact that it managed to reduce the number of shares outstanding by 14% over the past decade. The rate of dividend growth has tracked the growth in earnings per share over our study period. The company earned $1.06/share in 2007, and managed to grow it to $2.42/share by 2017. Analysts expect that Eaton Vance will earn $3.21/share in 2018. The company has been able to grow revenues by growing assets under management. Assets have increased by attracting new client inflows, acquiring assets through acquisitions and through price appreciation. Market appreciation is a strong long-term tailwind, which can grow assets under management and related fees over time. If customers add money to the base on a net basis, assets grow even further. Good relative performance is rewarded with client inflows. In general, clients have tended not to move assets out once they have been invested. Inertia can be a powerful force. But you cannot blame them for staying – there is an opportunity cost associated with switching investment products and strategies. For other strategies focusing on tax managed assets, retirement plan assets or closed-end-funds, you have a more sticky asset base that is less likely to leave. The company is adapting to the changing needs of the customers by launching new products, which also attracts more money under management. The price to pay of course is that during bear markets, assets under management will likely decline, dragging down short-term results with it. There is an element of scale with investment managers. It doesn’t take that much effort to run more money, but on the other side the cost gets spread over a larger base, resulting in higher profit margins. There is a large amount of competition, and a pressure on fees. Passive investing funds are gaining in popularity during the strong bull market we have been experiencing. In total, passive investment funds have been generating inflows, while actively managed funds have generated outflows. The dividend payout ratio is at 48% today, versus 48% in 2007. While there were some fluctuations along the way, it remained in a 37% - 59% range over the past decade. Right now, I find Eaton Vance to be attractively valued at 14.40 times forward earnings. The stock yields a safe 3%, which is well covered by its earnings. In addition, earnings grow over time, which bodes well for future expected dividend growth. Last week, there was a correction in the stock market. For some reason, be it higher interest rates, trade wars, or fears of future inflation, stock prices went down. Your guess as to why this happened is as good as mine. The reason why this happened is not required to be a successful investor however. As a dividend growth investor, I see myself as a part owner of a business. As a result, my focus is on acquiring shares in those businesses at attractive valuations. I could not care less about stock price fluctuations, other than as an opportunity to acquire more ownership in the world’s best run businesses at attractive valuations. I focus on dividends, because dividends are more stable and more predictable than share prices. I focus on companies that can generate stable earnings and reliable dividend payments. Only a select few companies have even managed to grow dividends for more than a decade. A long streak of consecutive dividend increases is one of my filters to search for quality. A strong balance sheet, and the ability to generate strong recurring cashflows is the secret sauce that allows long track records of annual dividend growth to occur. I focus on the companies that can grow earnings per share, reinvest a portion to grow the business, and send any excess cash flows to shareholders in the form of dividends. I want those businesses at good entry prices however. The next step in the process is evaluating the fundamentals of these businesses. As I mentioned in my article on how I analyze dividend stocks, this involves looking for growing earnings to support the future dividend growth. Evaluating the safety of those dividend payments is paramount. Since dividends are a direct link with the fundamental health of the business, they are a form of return that is usually more stable and reliable than capital gains. Share prices on the other hand are derived from the collective expectations of stock market participants. Sometimes they are overly excited about the prospect of a business, and are willing to pay a high multiple for every dollar of earnings. Other times, these participants are gloomy, and not willing to pay even a bargain price for these earnings. Stock prices are driven by the madness of the participants with short-term expectations. As investors, our goal is to capitalize on those who set prices in the short run, and buy our future retirement income on sale. Our goal is to select the best businesses in the world, and buy them at attractive valuations. Our job after that is to monitor our holdings, and sit tight, as we are showered with a rising stream of dividends over time. Since my focus is to grow my dividend income over time, I can focus on the dividend income, its safety and its potential for future growth. I could not care less if stock prices go up or down in the short-run. As a result of the decline in the past week, I am seeing several companies I am monitoring for my dividend growth portfolio newsletter become attractively valued today. I will share the selections I am making on October 28 with premium subscribers. If further weakness continues, the list of potential additions to the portfolio will increase. That is great news, because I like to build out diversified dividend portfolios, in order to ensure that I generate a retirement stream of income that is defensible and can grow above the rate of inflation. For example, Johnson & Johnson (JNJ) is selling at $133/share today, versus $142.88 at the highs last month and $148/share in January. The company is still expected to earn $8.15/share, yet participants valued the shares at different multiples. The company is still expected to pay $3.60/share in dividends. In another example, 3M (MMM) is selling at less than $198/share today, versus $216 in September and $260 in January. At the same time the stock is attractively valued today using forward earnings at $10.29/share. 3M is expected to pay $5.44/share in dividends. During the financial crisis, Johnson & Johnson’s share price fell from a high of $72.76/share in September 2008 to a low of $46.25/share in March 2009. At the same time, earnings per share went up from $3.63/share in 2007 to $4.57/share in 2008. Johnson & Johnson earned $4.40/share in 2009. The company’s dividend payments between 2007 and 2009 were $1.62/share in 2007, $1.80/share in 2008 and $1.93/share in 2009. Investors owning JNJ shares who focused on the growing stream of dividends could have been able to ignore the fact that share prices are volatile. They could do this, because the company they invested in had solid fundamentals, and the dividend was well covered and poised to grow. The diversified portfolio of businesses under the Johnson & Johnson umbrella represented products that consumers use on an everyday basis, which meant that the demand will not decrease as much during a recession. Those with cash to invest, would have been ecstatic to buy ownership interests in a world class business such as Johnson & Johnson below $50/share, rather than pay over $72/share for the same shares. It is very likely that at some point, we will be entering a bear market. Investors in the accumulating phase should be looking forward to bear markets, because they will be able to buy shares in their favorite businesses at better entry valuations. This would mean that shares on other world class businesses such as Visa (V) and Starbucks (SBUX) will be available for sale at less than 20 times earnings. To summarize, lower entry prices should be welcomed by dividend investors in the accumulation phase. As a result of lower prices, they can purchase future dividend income at a discount. Investors in the retirement phase should ignore stock price volatility, and should focus on dividend income, which is more stable, reliable and predictable than share prices. When you are paid for owning shares, holding those shares through the ups and downs of the economic cycle is much easier. Either way, the most important thing is to stick to your dividend portfolio through thick or thin. The consistency of dividend payments makes it easier to stick to your portfolio, and add to it, even when share prices are tanking. The investor with a clear strategy to pursue dividend paying equities, will continue following their plan, and invest money regularly in the best values at the moment. This consistency and long-term focus is the secret sauce that will help them succeed and reach their long-term goals.